Local entrepreneur Joel Dondis is in the business of food. Joel Dondis was already well-versed in the art of cuisine when he started his first business, a catering operation, with a $5,000 loan and a car. But Dondis quickly realized a catering business was about more than appealing food. Dondis has taken this lesson to heart. That’s why he calls himself the CXO (Chief eXperience Officer) of his many businesses, which include Joel Catering, and restaurants La Petite Grocery and Grand Isle. Of course, there’s also Sucré — a retail store best known for its gourmet sweets and fancy cakes, but also encompassing an online store and branded products. These businesses keep growing. A big expansion coming up for Joel Catering is the addition of a new event venue on Magazine Street dubbed Il Mercato. Located next to Sophie Wright Place, and slated to open in June, the space used to be the site of an open-air public market that stretched the length of a city block. During the Depression, the Works Progress Administration created a covered market, one of several around the city that thrived until shoppers gravitated to grocery stores in the 1950s. A sign fabrication shop took over the building for many years. Now it’s being reclaimed into the city’s culinary heritage. Dondis loves the building’s food-related architectural details, like a repeated motif of fish jumping along the gutters, and the crest over an entrance that features a waterfowl, two kissing pigs and copious fruit. He’s adopting the crest as a logo. Meanwhile, Sucré is opening a two-story outpost in the French Quarter this spring. Dondis also has developed a mass-market French-macaroon candy called MacBubl by Sucré, which is rolling out this year at certain Whole Foods Market locations around the country. Depending on demand, he’s expecting to build a manufacturing facility in the near future. He’s sharing these ventures with his Sucré chef-partner Tariq Hanna. Dondis doesn’t really work in the kitchen anymore at his businesses, at least not on a daily basis. But he still offers tastings, as well as opinions on what his chefs create. Recently, he visited a sugar mill to consider working with a new kind of sugar. So he’s still involved with food; now it’s just on a higher level. To that end, Dondis has been involved since its early days with the Idea Village — a non-profit organization that supports fledgling New Orleans businesses. 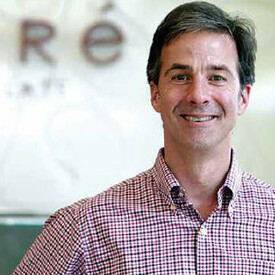 He first pitched his idea for Sucré there, and these days he mentors up-and-coming entrepreneurs. He notes that if he had had the Idea Village as a resource when he started his catering business, he could have saved a lot of time. Dondis’ father, who was shaped by the Depression, imparted a strong work ethic to his children and made it a priority that the family ate together. As a child growing up in Lake Charles, Joel realized that if he cooked a meal, his dad would give him a pat on the back. It didn’t take long for him to embrace his natural cooking talents and his love of good food. At age 11, he worked as a dishwasher at a restaurant owned by his father’s friend, a chef originally from the Basque region in Europe. Dondis soon apprenticed under him. Later, he traveled to Houston during the summers and worked in a restaurant kitchen in exchange for a free place to stay at the owner’s home.